Well, Vancouver's Maker Faire has been turning out gangbusters, as I expected. The crowd is inquisitive and hands-on with the learning displays. Willing and interested in trying out knots. Wanting to know about workshops or local guild meetings. I was sad to report that the PAB meetings are in Los Angeles, but with the level of interest I was observing I see no reason we can't have our own... branch? sub-branch? meetings! Being the purely decorative sort, it would not be completely simple to help out learners with practical knots, but as I told people, I have all the books and given some warning I can try to work out in advance something in particular that they want to learn. I have nothing if not hubris and the type of mind that works well with learning from books. Of course, other tactics come to mind. I could put out a inquiry to the local sailing schools, I could hunt down Terry or David (that luddite who refuses to be online 8), I could bribe some of the Seattle boys to come up once in a while, etc, etc. Vancouver's first Maker Faire is happening June 25-26th, 2011 and I'll be there representing the Pacific Americas Branch of the International Knot Tyers Guild. 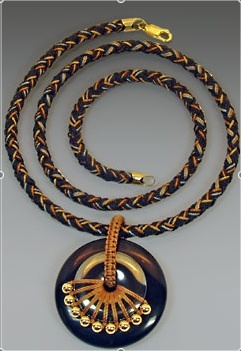 I'll have a variety of make-and-take projects and will give the occasional rope making demo (participatory!) using (repurposing) plastic grocery bags (in the spirit of the event).